There’s a very popular children’s cartoon character in Japan called 「それいけ！アンパンマン」 (“Go! Anpanman“). 2009 has been a big year for 「アンパンマン」 (Anpanman) and for his artist Takashi Yanase. This year, Takashi Yanase turned 90 years old, he’s been a professional artist for 60 years, the 「アンパンマン」 (Anpanman) comic started 40 years ago, and the 「アンパンマン」 (Anpanman) television series started 20 years ago. (Click here to see an earlier post I wrote about this). And now, 「それいけ！アンパンマン」 (“Go! Anpanman“) is in the Guinness Book Of World Records for having the “Most Characters In A Single Animated Series“. 「それいけ！アンパンマン」 (“Go! Anpanman“) has over 2000 characters, but the Guinness Book only recognized 1768 characters…which still sets the record as the most characters. My kids grew up watching 「それいけ！アンパンマン」 (“Go! Anpanman“). It’s a wonderful cartoon for kids! Have you ever watched 「それいけ！アンパンマン」 (“Go! Anpanman“)? I like 「バイキンマン」 (Baikinman), 「ホラーマン」 (Horror-man), and 「だいこんやくしゃ」 (Daikonyakusha) best. Click here to see my post about the 「アンパンマン」 (Anpanman) Exhibit we went to last Spring. I didn’t know that Anpanman was so old! Now I guess I understand why everyone loves it so much!! Yes, Anpanman has become a staple of Japan. Almost every Japanese who is 25 or younger grew up watching Anpanman. Yes, (Sesame Street) is still on the air here, although it’s very different. And it’s still popular, I don’t know if it’s quite as popular as it used to be… I grew up watching it as well, and that was only 15 years ago…. Lately, the more popular shows have been the ones intended for older kids, but even the young group watches it. Like Hannah Montana and those type. My 5 & 7 year old cousins have liked Hannah Montanna for a couple years! Sesame Street in Japan used to be completely in English until a few years ago. Now it’s mostly in Japanese and they introduce a few English words in each episode. My kids used to watch it when they were little and it was still all in English. The Sesame Street TV show was never really popular here. 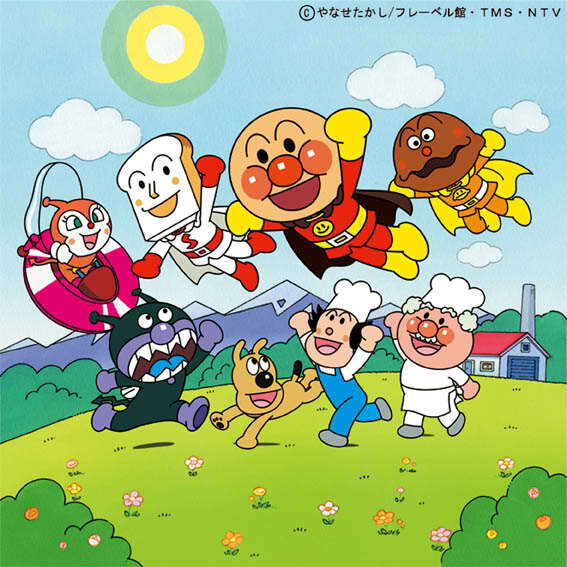 There are other Japanese kids shows (such as Anpanman) that are much more popular. The Sesame Street characters are popular in Japan, though. But the show’s not. Does your son watch the Anpanman cartoons on TV? They teach kids important things such as good hygiene, empathy, manners, etc. Congrats to them. About 2000 characters in 20 seasons/series of the anime alone? Dang. And they managed to fit 40 years worth of characters in all that? The Simpsons have been around (in cartoon form, at least) for that long and don’t even have 1/4 that amount. I think Pokemon comes next, with 493 pokemon, plus all the main characters, AND all the one-shot characters. Yeah. There are many characters! I’m not positive, but I believe a new character gets introduced in every episode.